Well, the Gods of Random have spoken and the winners of the coveted Hook Me Up! Exclusive Alien Diplomacy ARC Contest have been chosen. As is their wont and their quirk, the GoR smiled both on those who commented a lot and those who commented not at all, proving again that the GoR live to be capricious. So, with appropriate drum rolls and fanfare, we give you the winnahs! NOTE FOR WINNERS: You MUST send me an email with your full name, mailing address, and what name you'd like your ARC personalized to by Friday, February 3, 2012, or the Gods of Random will demand a sacrifice and your ARC will be given to a new winner chosen at random. Congrats to all the winners. Condolences to all those who didn't win. (Whine to the winners and the GoR, though, I'm just the messenger. I swear!) Thanks to all for making this a great, fun contest. To those who won - enjoy! To those who didn't - there's always next time...and we promise there will always BE a next time! Hey there! Hope everyone had a lovely weekend and that this week's going well. I know everyone's prepped for the upcoming weekend, too. But before then, we have lots of fun stuff for you, so let's get to it, shall we? First up, there's a new humor short up at Random Musings. (I'll wait while half of you recover from your fainting spells at this news.) Check out what I've been listening to far more than is probably good for me with The Repetition That Soothes The Savage Writer-Beast. Then, check out my FIRST EVER podcast over at SciFiSurplus where I wax rhapsodic on things like my books, what I watch on TV, and more...much, much more. Turn up the volume and don't stop the signal! Then, let's get caught up on the last of the Best of 2011 posts. Check out what Readaholics Anonymous liked best. Now check out what My 5 Monkeys got in her mailbox, what Suburban Fantasy and Science Fiction is waiting on, and what Blethering About Books chose for Warp Speed Wednesday. And see what Night Owl Reviews thought of Alien Proliferation. Last but in no way least, the Alien Diplomacy ARC Contest is going strong. Of course, it's also still for Hook Me Up! subscribers only. Still not on? There's still time -- it doesn't close until this Sunday, January 22nd. Send an email to gini@ginikoch.com with "Hook Me Up!" in the subject line and you'll get instructions for how to enter the most hotly contested contest around. That's it for now, but as always, there's always more coming. So, have wonderful weekends and let's be readers out there. Peace out, my li'l gangstas! It's time to get your win on and grab an ARC of Alien Diplomacy while the grabbing's good! There are 5 (that's right, FIVE) ARCs up for grabs, which means lots of opportunities to score an early Advanced Reader Copy of Book 5! So, Hook Me Up! subscribers who have sent in your proper entry emails, riddle me this: What's the most diplomatic you've had to be, and why? Contest will run from Wednesday, January 11, 2012 through Sunday, January 22, 2012. Winners will be announced week of January 23rd. This is an international contest -- as long as you're on Planet Earth, you can enter and win. You must have a deliverable address, though - no P.O. boxes. Prize may take 2-4 weeks to ship; it may take 6-8 weeks for international. This is a contest for Hook Me Up! subscribers only -- if you're not on, send an email to gini@ginikoch.com with "Hook Me Up!" in the subject line and you'll be sent the contest entry rules. Happy Hump Day! I have some very exciting news to share. Writing as G.J. Koch, I've just sold Alexander Outland: Space Pirate to Night Shade Books. The book will release in paperback and ebook formats June 5, 2012. I can't wait to share this new series, cast of characters, and galaxy with all of you! So, fasten your seatbelts -- it's gonna be a hilarious, rollicking ride! Happy Monday and Happy New Year! Hope everyone had lovely holidays, took some time off, and had a wonderful first week of 2012. 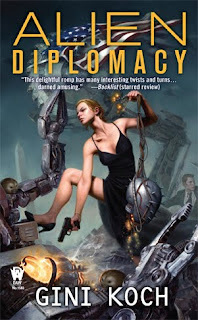 I was busy with galley edits on Alien Diplomacy...and speaking of Alien Diplomacy, we have some exciting news for you. But first, let's get all caught up on what's been going on, shall we? First up, check out what My 5 Monkeys, Mark of the Stars, and Redlines and Deadlines considered the Best of 2011. Then see what Cybermage finished out the year reading. Then, hit Goodreads and vote for your most anticipated book of 2012 (I won't complain if you pick Alien Diplomacy, of course). After that, see if your list matches the most anticipated books over at Larissa's Bookish Life. Head over to The Galaxy Express to get an updated idea of what's coming in SFR in 2012. Now, let's check out some reviews. See what Short & Sweet Reviews thought of Alien Tango. Then check out what Feeling Fictional and Fresh Fiction thought of Alien Proliferation. Now, to clarify that Alien Diplomacy tease from earlier. My Advanced Reader Copies arrived, and you know what THAT means...that's right! The Alien Diplomacy ARC Contest is going to start THIS WEEK. This one's going to move fast -- but like all the best contests, it's for Hook Me Up! subscribers ONLY. Not on? Rectify immediately by sending an email to gini@ginikoch.com with "Hook Me Up!" in the subject line. Then get ready to get your win on!